You all know I love shopping local and today I wanted to share with you a fabulous new boutique called Blue Hem in South End Charlotte. If you are looking for high end, luxe denim, this is your splurge spot! Blue Hem has every color and style of denim you can imagine, and I had so much fun styling three different fall looks that I hope will inspire you to try a new look this week! Blue Hem offers both men’s and women’s fashionable, high quality denim and carries great brands like McGuire, James Jeans and Diesel along with unique brands from small handcrafted places in Raleigh and Soho. They take the time to help each customer select the denim that works best for them – from the size to the color to the functionality (going out, dressy, casual, wear to work, etc.). It’s definitely not your typical department store shopping experience! I styled three different fall looks during my shoot. The first was a higher-waist dark wash ankle length denim. This is perfect to pair with a stylish flannel top and heels or booties for the weekend. I love mixing the plaid top with the cheetah heels for a fun look, and the ankle length really help show them off. And, let’s be honest, the higher waist is a must-have when I’m chasing Brexton around! The second was a distressed wash black denim that could seriously be worn so many ways. I paired it with a stylish but casual lightweight sweatshirt and booties. But this look would work great with a black moto jacket and a cute scarf and you’d be totally on trend this fall. The last look might be favorite … a dark wash, high waist flare. You’ve probably noticed I love the 70’s look, so this was right up my alley. I paired it with a flowy, off-the-shoulder crop top that is a great transitional piece from summer to fall (especially since it was in the 80’s all weekend here in Charlotte!). 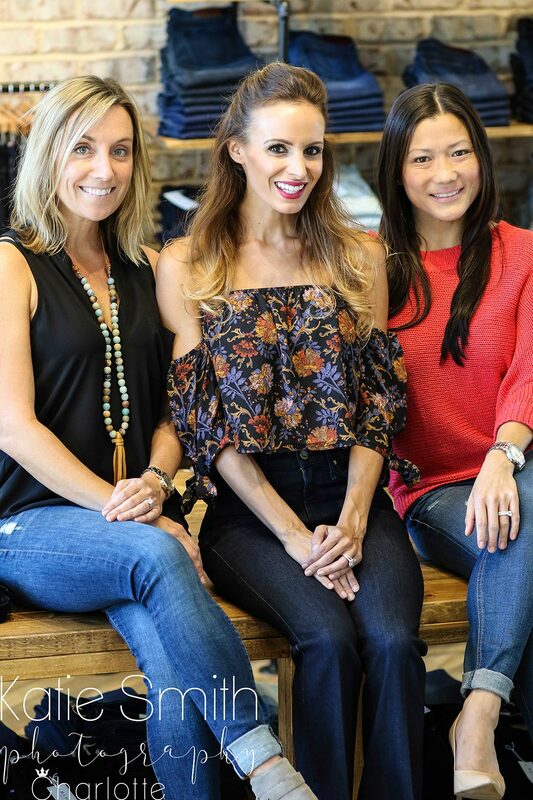 Blue Hem was started by sisters Vanessa and Suzy – and you know I love supporting women-owned businesses! Check them out on Instagram and Facebook or stop by and visit them at the store at 1750 Camden Road, Charlotte, NC 28203 (below the Camden Gallery apartments). I also want to give a shout out to the talented and lovely Katie Smith of Katie Smith Photography. Katie is a Charlotte-based photographer who specializes in Charlotte pets and families – she has a great eye and was super fun to work with for this shoot. Definitely check her out for your next family photo shoot in Charlotte!